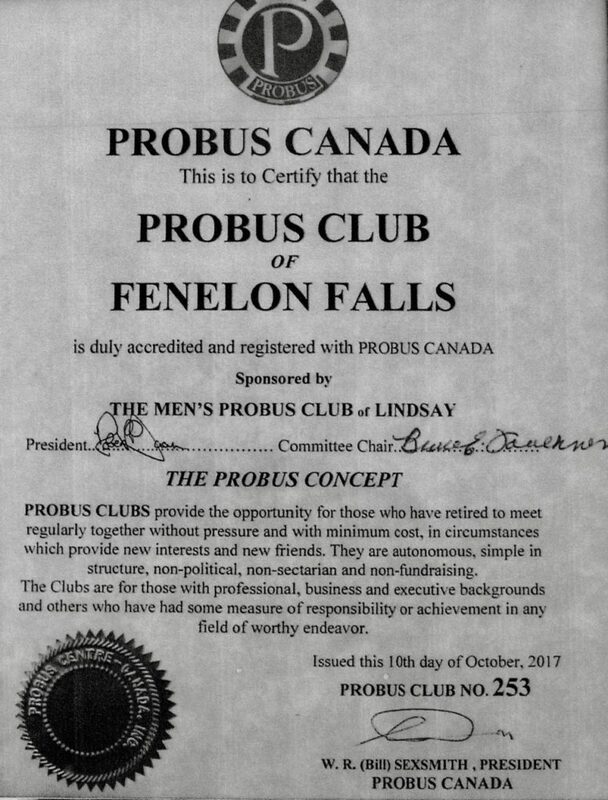 The Men’s PROBUS Club of Lindsay (part of PROBUS District #1), was sponsored by The Men’s PROBUS Club of Newmarket. 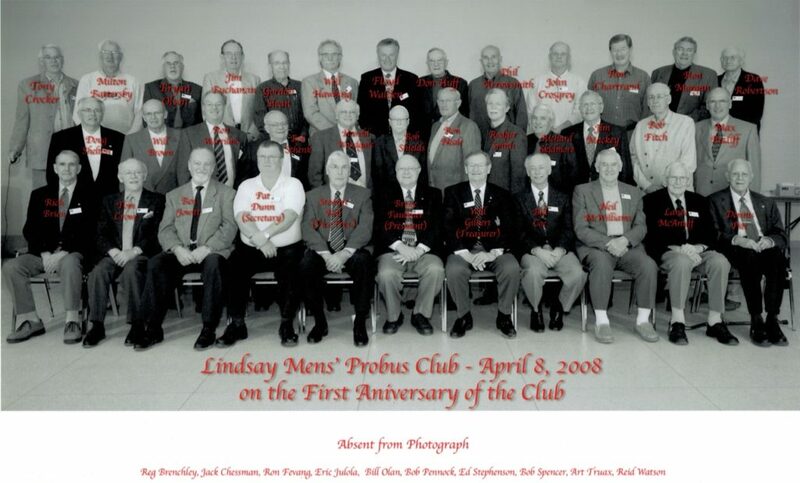 The Club’s Charter #185, was signed on February 23, 2007 with seventeen members attending the chartering ceremony. 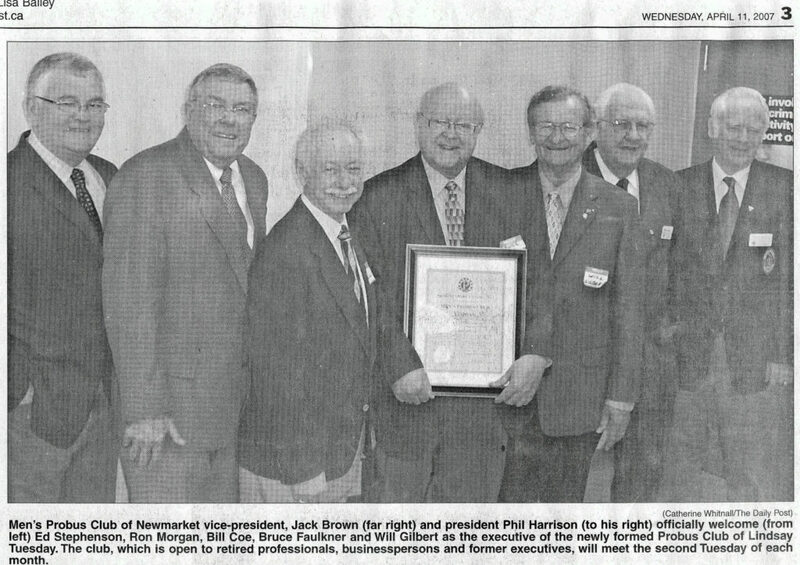 The first president was Bruce Faulkner (now a Life Member) who served from May, 2007 until May, 2009. The members name badge boxes were made by Ed Stephenson and Reid Watson. The wood framework was made by Ron Morgan, while the bell itself was donated by club member Gordon Sloan. The bell had been presented to Gordon’s father, who was the vice president/sales for the Colgate Palmolive Company, by his staff in recognition of a sales record. The lectern was designed and crafted by Reid Watson. 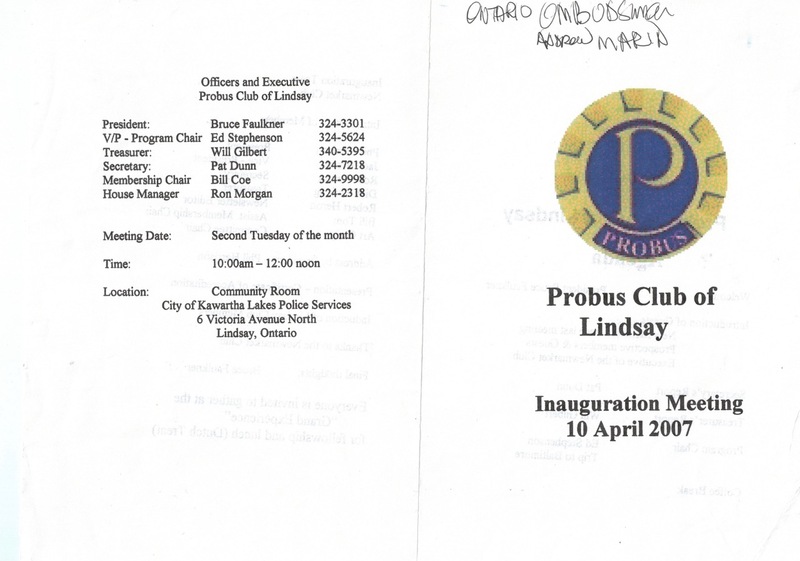 The PROBUS crest on the lectern was sculpted by Jim Buchanan. The club banner was designed by Bruce Faulkner and Stewart Kell. Major Leo Phillips (Administrative Commander for 22nd Wing North Bay) was a guest speaker at a Remembrance Day program and he presented this flag to our Club. It is a replica of the flag that is on display whenever the Joint Chiefs of Staff meet and cannot be purchased through any vendor. The flag has 3 symbols that represent all 3 detachments of our Canadian Armed Forces (Army, Navy and Air Force). 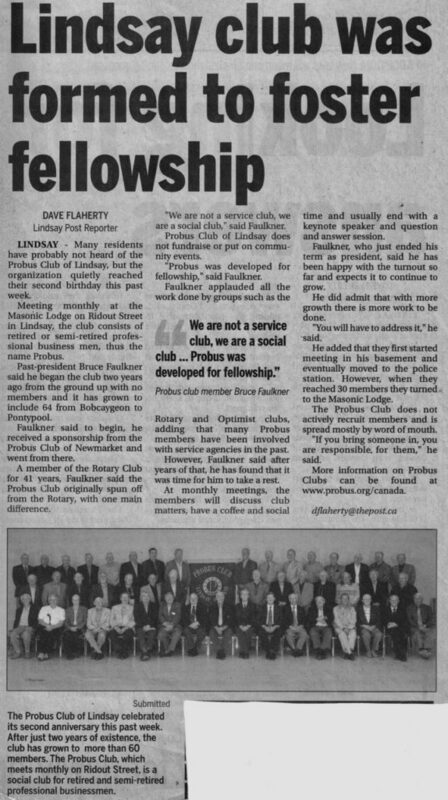 The club newsletter was originated by the first club secretary, Pat Dunn. Further refinements have been made over the years and will continue to evolve with each new editor. 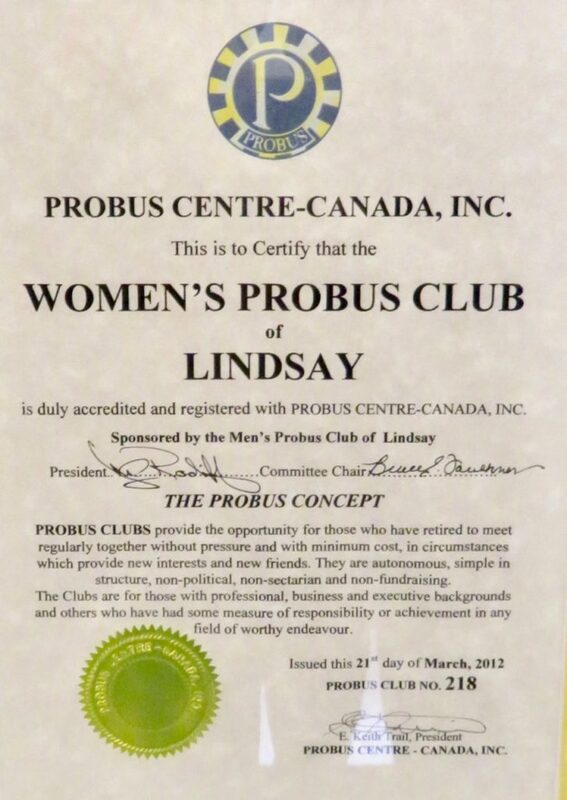 Our club had the honour of sponsoring the Women’s PROBUS Club of Lindsay. 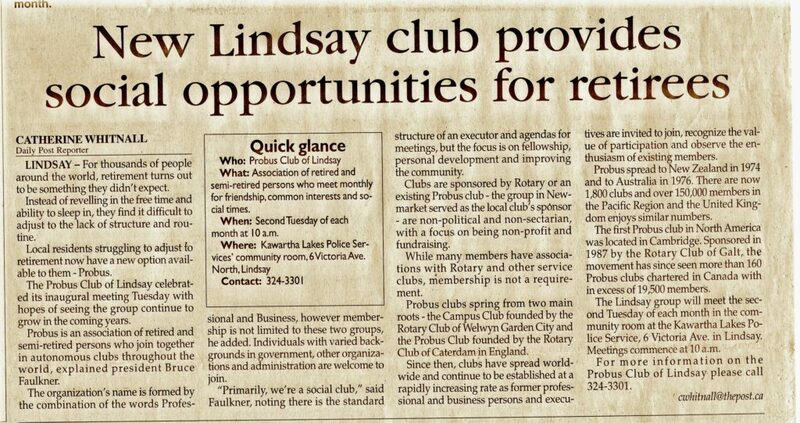 Chartering meeting took place on February 28, 2012 at the Masonic Temple Hall, Lindsay. 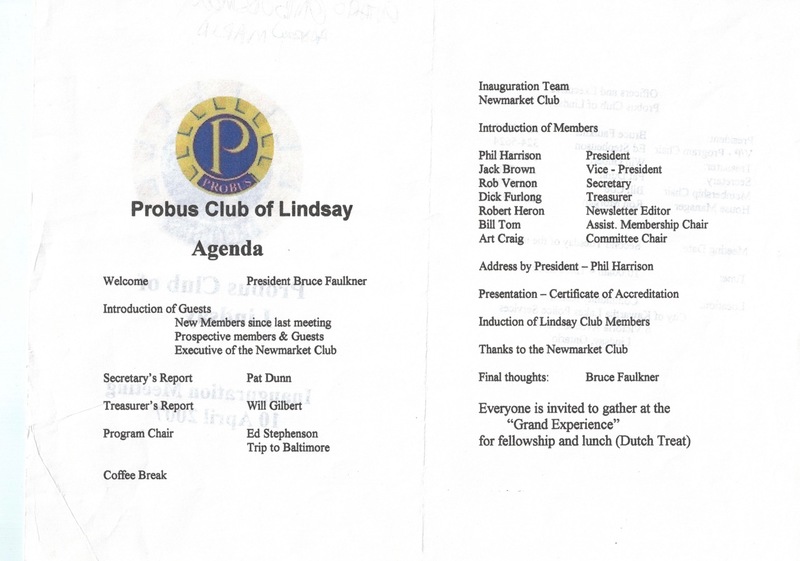 The new Club’s Charter was presented by the PROBUS Men’s Club President of the day.